Fool Gone Mad are the Champions! The team of IM Jimmy Liew, NM Lim Zhou Ren, FM Peter Long, Zaidan Zulkifli and Sumant Subramaniam playing under the banner of KL Fool Gone Mad emerged as the best Malaysian team at the ASTRO Rapid Team Championships 2012. In the first two days of play, Olympiad bound Zhou Ren carried the burden of top board while I too pushed up to second board and together with big contributions from Zaidan and Sumant, we put the team in a strong position for the final day of play when Jimmy joined the team for the all important push in the last two rounds. Polgar Dragons – Best Junior Team! 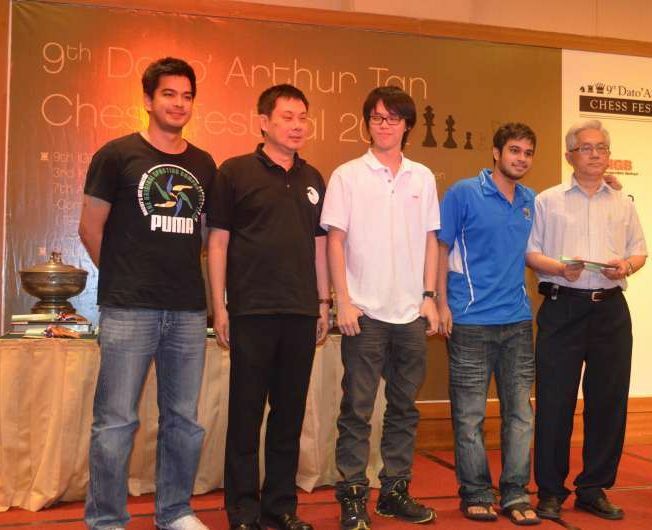 All in all it was a great success and a really a tribute to fine team spirit together with a more balanced line up which made the difference in edging the more fancied top ranked all Malaysian Chess Tigers team which boasted FM Nicholas Chan, IM Mok Tze Ming and Yeoh Li Tian. Sumant and Nicholas will not be joining fellow national representatives Mok, Li Tian, Jimmy and Zhou Ren as they travel tomorrow together with IM Lim Yee Weng to represent Malaysia in the World Chess Olympiad being held in Istanbul but will most certainly have their very best wishes for every success and happily enough I will also be there as coach of our women team. With a month to go I am overwhelmed by the response to the DYTM Raja Nazrin Shah International Open 2012 – despite only having 80 places we are oversubscribed and despite my best efforts to discourage too many GMs from playing (given we have only 20 prizes and with just 10 worth talking about), I already have fifteen of them! Best is that we will have two 2600+ players for the first time. On overall participation, Indonesia has already informed me earlier that many of their players would be obligated to play in their national games held during the same period but I still have a decent representation and the extra large Filipino delegation and very good turnout from my friends from Vietnam has more than made up! Brunei has yet to confirm the names of their representatives but we have our first serious players from Thailand, a number of expats there will be making the short flight, and of course the Uzbekistan connection remains strong. I am very grateful for all this support - the GMs, National Chess Federations, and of course our faithful friends. What I am a bit surprised at is the complete lack of interest from Singapore – I know their chess is going through a bit of transition with a ‘golden’ generation having largely moved on – so maybe their young players find the numerous international youth events being organised today more than sufficient but I also feel that a big contributor (not just Singapore but for all young players in many regional more developed countries generally speaking) is that there is no longer clarity in terms of objectives for young talent, let along alignment amongst the various stakeholders. Despite many of our top players being amateurs and again being unavailable especially with the Istanbul Olympiad ending a week before, I have a very decent and representative turnout from Malaysians. See www.klchess.com for more details as they become available. Elgin Lee wins first Saturday Budapest August! World Youth U-16 Olympiad bound Elgin Lee won the FM A-1 Group with 9.5/11, a whopping 2 points clear of the second placed participant and in doing so also gained some 60 rating points. Elgin had won nine games in a row and was already champion when he lost his tenth game and then drew the last round, perhaps more a consequence of getting his exam results although having already won and having a rest day must have contributed! It is indeed a great success as Malaysians rarely win an international tournament at senior level. Young siblings William also did credibly, getting 4/10 in a double round robin and around 12 rating points in FM A-2 while Benjamin scored 4/9 to achieve an estimated initial rating of 1633. The Hong Kong International Open Chess Championship 2012 will be held at the University of Hong Kong from 27 September to 3 October. The prize fund is sponsored by Rosneft under the patronage of FIDE President Kirsan Ilyumzhinov. 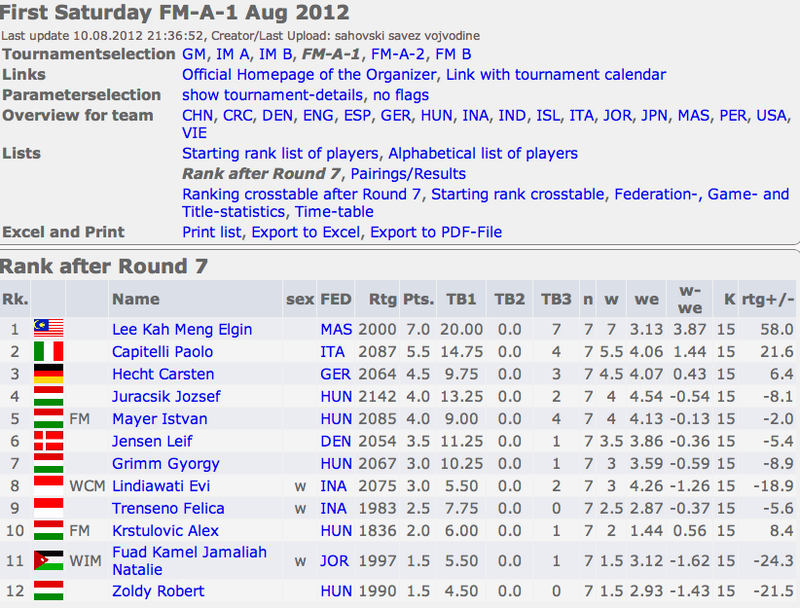 Elgin Lee is 7/7 in Budapest and on Track to a Perfect Score! The cross table sats it all! Elgin Lee is on 7/7 and on track to a perfect score. His brother William has 2.5/7 in FM A 2 but is still winning some rating points while their 11 year brother Benjamin whom I only recently found out is also playing - in FM B - has 3.5 to be on 50 percent. Now that the teams have been picked for the World Chess Olympiad to be held in Istanbul from 27 August to 10 September 2012, the focus of the local chess community has switched to looking to play in the coming rapid events Battle Chess Selangorku 11 August 2012 and then the IGB Dato’ Arthur Tan Open 20-22 August 2012 and ASTRO Teams 23-25 August 2012. But little known is that Malaysia is also being represented in the World Youth U-16 Olympiad to be held during the World Chess Olympiad and that is from 28 August to 6 September 2012. Two members of the team, Elgin Lee who was also part of the dream team last year which included current national Champion Roshan Singh, Yeoh Li Tian, Wong Jianwen and Yeap Eng Chiam, and his younger brother and current National U-14 Champion William Lee, are taking it very seriously, opting to train and play in Budapest, Hungary! In the on going First Saturday August 2012 Edition, Elgin is playing in the FM A 1 Tournament while the lower rated William is in the FM A 2 Tournament. Elgin who is only seeded 8th amongst the 12 participants which include two Indonesians is in great form, leading the FM A 1 with 4/4! 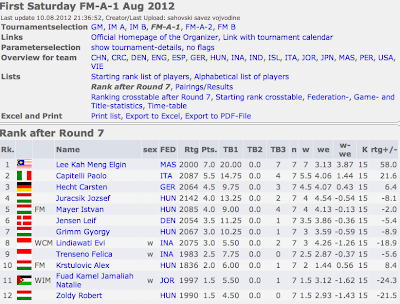 See http://www.firstsaturday.hu/1208/fma.htm but William who is ranked is 5th amongst the 6 participants including yet another Indonesian (none other than Jamals Hendry!) in the double round robin FM B 1 is not doing quite as well with just 1/4 to date. Let’s wish our young dedicated players success and whatever the final result, they will certainly have greatly benefited from the experience! Very Nice Mention of the DYTM Raja Nazrin Shah 2012 by Susan Polgar!